The name Stilley is a Swedish name that is the Anglicized version of the name Stille. Pers Stille was born circa 1584 in Sweden. He died circa 1631-1635 at the Humblo Farm, in Roslagen, Sweden. His wife's name was Britta and they had at least five children: Axel, Anna, Johan, Kerstin, and Olof (see next generation). He and his family lived on the island of Solo, in Roslagen, Sweden. Pers was the supervisor of the Penningby estate in Sweden and when he retired in about 1627, he was given a farm on the island of Humblo, Sweden. Pers died there in about the 1630's. Olof Persson Stille was born circa 1610 on the island of Solo, in Roslagen, north of Stockholm, in Sweden. He died circa 1684 in Moyamensing, Philadelphia Co., Pennsylvania. In about 1627, Olof moved with his family to the island of Humblo, Sweden, where they had a farm. Olof was married at this location, but the name of his wife is not known. Olof and his wife had four children: Ella (we also descend from her), Anders (see next generation), Christina, and Johan. Olof apparently did not get along well with the Lady of the Penningby estate and in 1636, he publicly voiced his opinion about her. Lady Catarina Fleming responded by taking away his farm. Olof refused to leave the island was imprisoned. After his release, Olof resettled with his family in Matsunda, Sweden. In 1638, Olof broke into prison to help a man named Anders (former servant of Lady Fleming) escape. Olof was later arrested and convicted to death on April 13, 1638. The punishment was later dropped to a 100 daler fine (about 17 months of pay). About three years later, Olof had paid off his debt and in May 1641, he and his family decided to leave Sweden. That same month, he, his wife and two children, left Sweden bound for the colony of New Sweden in America. The place where they settled is now New Castle County, Delaware. Apparently the Indians in the area were friendly towards Olof, but did not like his black beard. Olof was a mill maker and a leading citizen in New Sweden. In 1650's, New Sweden came under the control of the Dutch, but they were allowed to keep their own government. Olof served as Chief Justice of the Swedish Court from 1656 to 1664. In that year, Olof moved with his family to Moyamensing, Pennsylvania, where he died in about 1684. Olof married name unknown circa 1633 in Sweden. 1 Ella Olofsdotter Stille was born circa 1634 in Humblo Island, Roslagen, Sweden. She died on January 22, 1717/8 in Swedesboro, Gloucester Co., New Jersey. She married Peter Jochimsson circa 1651 in Pennsylvania. We also descend from this child. Her great-great-great-granddaughter, Margaret Bell married Benjamin Custer. 3 Christina Stille was born circa 1643 in New Castle Co., Delaware. She married Marten Roosemond. 4 Johan Stille was born circa 1646 in New Castle Co., Delaware. He died in 1722 in Moyamensing, Philadelphia Co., Pennsylvania. He married Gertrude Gerritsen circa 1683. Anders Olafsson Stille was born circa 1640 on Humblo Island, Roslagen, Sweden. He died circa 1688-1692 in White Clay Creek, New Castle Co., Delaware. He was only an infant or toddler when he emigrated with his family from Sweden to what is now Delaware in 1641. In about 1658, Anders moved to New Castle, Delaware, where he lived for some time. There, he married Annetje Pieters before 1671. Soon after this, they moved to Christina Creek in New Castle County and then to White Clay Creek in New Castle County, where they remained. Anders died there sometime between 1688 and 1692. He and his wife had at least three children: John, Elizabeth, and Jacob (see next generation). Anders married Annetje Pieters before 1671 in New Castle Co., Delaware. She was born circa 1650 in New Amsterdam (now New York City), New York. She died in New Castle Co., Delaware. Jacob Stilley was born circa 1687 in New Castle Co., Delaware. He died on February 6, 1774 in Christiana Hundred, New Castle Co., Delaware. He married there in about 1708 to a woman named Rebecca Springer. They had at least ten children: Andrew, Maria, Peter, Susanna, Elisabeth, Margareta, Rebecca, John, Lydia, and Jonathan (see next generation). Jacob Stilley died on February 6, 1774 in Christiana Hundred, New Castle Co., DE. His wife died there after 1764. Jacob married Rebecca Springer circa 1708 in New Castle Co., Delaware. She was born circa 1689 in New Stockholm, Gloucester Co., New Jersey. She died after 1764 in New Castle Co., Delaware. 2 Andrew Stilley married Catharina Stalcop. Jonathan Stilley was born circa 1709 at Christiana Hundred, New Castle County, Delaware. He died on April 21, 1765 in New Castle Co., Delaware. Jonathan married Magdalena Vandever on April 17, 1735 in Wilmington, New Castle Co., Delaware. She was born on November 5, 1718 in New Castle Co., Delaware. She died on April 21, 1765 in New Castle Co., Delaware. 1 Rebecca Stilley was born on January 23, 1735/6. 2 Anna Maria Stilley was born on August 14, 1737. 3 Magdalena Stilley was born circa 1738. 5 Johan Stilley was born circa 1742. He married Sarah French on November 14, 1763 in Wilmington, New Castle Co., Delaware. 6 Elizabeth Stilley was born on July 18, 1744. 7 Hannah Stilley was born circa 1746. 8 Dinah Stilley was born on February 27, 1750/1. 9 Sarah Stilley was born on February 8, 1754. 10 Samuel Stilley was born on March 21, 1756. 11 Ephron Stilley was born on November 14, 1761. Jacob Stilley was born on September 3, 1739 at Wilmington, New Castle Co., Delaware. He died March 17, 1777 in Fort MacIntosh, Pennsylvania. He was of Swedish and Dutch decent and was named after both of his grandfathers, Jacob Stilley and Jacob Vandever. He was raised in Wilmington, Delaware, where he married Anne French on February 5, 1760. Together, they had a family of at least ten children: Rachel, Uriel, Jonathan, Sarah, Hannah, Tobias, John, Rebecca (see next generation), Elizabeth, and Peter. Sometime during the late 1760s or early 1770s, Jacob and his family moved out west and settled on a farm in Jefferson Township, Allegheny County, Pennsylvania. There farm was at the location of the present-day Jefferson Methodist Church and Cemetery. At times, Jacob was stationed at nearby Fort Macintosh, to help defend the settlers against attacks from Indians. On March 17, 1777, he was killed by the accidental discharge of a gun in the hands of one of his comrades. Apparently, some time after his death, several of Jacob's children were taken captive by Indians in the area and apparently one of those (Sarah) died while in captivity. At the time of his death, Jacob owned 192 acres in Allegheny County, Pennsylvania. His widow Anne died there after 1801. Jacob married Anne French on February 5, 1760 in Wilmington, New Castle Co., Delaware. She was born circa 1739. She died after 1801 in Allegheny Co., Pennsylvania. 1 Rachel Stilley was born on October 29, 1760 in New Castle Co., Delaware. She died after 1801. She married Robert Kennedy. 2 Uriel Stilley was born on December 25, 1761 in New Castle Co., Delaware. 3 Jonathan Stilley was born before June 16, 1764 in Wilmington, New Castle Co., Delaware. 4 Sarah Stilley was born circa 1765 in New Castle Co., Delaware. She died before 1801. 5 Hannah Stilley was born circa 1767. She died before 1801. She married John Percival. 6 Tobias Stilley was born circa 1769. He died on February 19, 1857 in Jefferson Twp., Allegheny Co., Pennsylvania. He married Ruth Pierson. 7 John Stilley was born circa 1771. He died in 1850 in Knox Co., Ohio. He married Rebecca Thompson. 9 Elizabeth Stilley was born circa 1775 in Jefferson Twp., Allegheny Co., Pennsylvania. She died after 1801. She married William Powell. 10 Peter Stilley was born on December 26, 1777 in Jefferson Twp., Allegheny Co., Pennsylvania. He died on October 14, 1819. He married Jane. Rebecca Stilley was born circa 1773 in Jefferson Twp., Allegheny Co., Pennsylvania. She died between 1830-1840, probably in Concord Twp., Champaign Co., Ohio. She was one of the youngest children of Jacob and Anne Stilley. She was probably named after her aunt, Rebecca Stilley, who was in turn named after her grandmother, Rebecca Springer Stilley. Rebecca spent her childhood and adolescence in Allegheny County, Pennsylvania, where her father died in 1777. In about 1795, Rebecca married to a man named Christopher McGill, who was a native of Ireland. They probably lived briefly together in Allegheny Co., Pennsylvania after their marriage. They did not remain there long and had moved to a unknown location in Kentucky before 1796. By her marriage to Christopher McGill, Rebecca had eight children: John, Elizabeth, Margaret, Esther, Tobias, Jane, Stilley, and Lucinda. In about 1800-1802, Rebecca and her family moved to Ohio. There, they settled on a farm in Concord Township, in Champaign County, Ohio. Rebecca and her family were Baptists and in 1805, she was one of the original members of the Kings Creek Baptist Church in Champaign County, Ohio. Sadly in the summer of 1806, Rebecca's husband Christopher died when he was thrown from a horse. Soon after his death (in 1807 or 1808) Rebecca remarried to a man named John Bousman, a widower with a family of grown children. 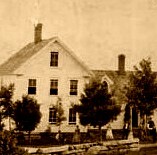 They lived together on the McGill farm in Champaign County, Ohio. By her marriage to John Bousman, Rebecca had three daughters: Maxamillia, Maria, and Barbara. Sometime during the late 1810s, there was some kind of fall-out or scandal in this family. In 1819, John Bousman stated that he was unable to support himself and disposed of his property to his wife Rebecca and other relatives. At that time, he moved to neighboring Logan County, Ohio, and Rebecca remained with their children in Champaign County. Over the next three years, they lived apart from one another. The reason for this separation is unknown, but it may have been an alternative to divorce. In 1822, John died in Logan County, Ohio. Rebecca was living in Champaign County, Ohio as late as 1830, but probably died between then and 1840. Although she probably died in Champaign County, Ohio, there is one unsubstantiated source which indicates that she died in Jennings County, Indiana (where her daughter Jane McGill Brown had settled in the 1820s). Rebecca married first Christopher McGill circa 1795 in Allegheny Co., Pennsylvania. He was born circa 1774 in Ireland. He died before December 8, 1806 in Concord Twp., Champaign Co., Ohio. 1 John McGill was born circa 1796 in Kentucky 1. He died between 1870-1880 in Benton Twp., Paulding Co., Ohio. He married Mary Shelley in August 31, 1856 in Paulding Co., Ohio 2. 2 Elizabeth McGill was born on April 23, 1796 in Kentucky 2. She died in 1879 in Bartholomew Co., Indiana 2. She married John Bozell on June 21, 1819 in Champaign Co., Ohio 2. 3 Margaret McGill was born on October 13, 1799 in Kentucky 2. She died on August 10, 1881 in Harrison Twp., Logan Co., Ohio 2. She married Samuel Spry on May 25, 1822 in Champaign Co., Ohio 2. 4 Esther McGill was born on October 14, 1800 in Kentucky or Ohio 2. She died on May 23, 1884 in Jasper Co., Indiana 2. She married John McCurtain on October 1, 1817 in Champaign Co., Ohio 2. 5 Tobias McGill was born in November 1802 in Concord Twp., Champaign Co., Ohio 2. He died on May 1, 1846 in Bartholomew Co., Indiana 2. He married first Rhoda Boswell on February 5, 1829 in Bartholomew Co., Indiana 3. He married second Mary Ann Fry on January 9, 1834 in Bartholomew Co., Indiana 2. 6 Jane McGill was born on May 9, 1803 in Concord Twp., Champaign Co., Ohio 2. She died on February 2, 1882 in Jennings Co., Indiana 2. She married John M. Brown on February 15, 1827 in Jennings Co., Indiana 3. 7 Stilley McGill was born circa 1804 in Concord Twp., Champaign Co., Ohio. He died on March 15, 1842 in Concord Twp., Champaign Co., Ohio. He married Jerusha McIntyre on December 6, 1836 in Concord Twp., Champaign Co., Ohio. 8 Lucinda McGill was born on October 27, 1806 in Concord Twp., Champaign Co., Ohio 4. She died on October 24, 1901 in Central Point, Jackson Co., Oregon 4. She married Campbell Ewing Chrisman on November 10, 1859 in Douglas Co., Oregon. Rebecca married second John Bousman circa 1807-1808 in Champaign Co., Ohio.